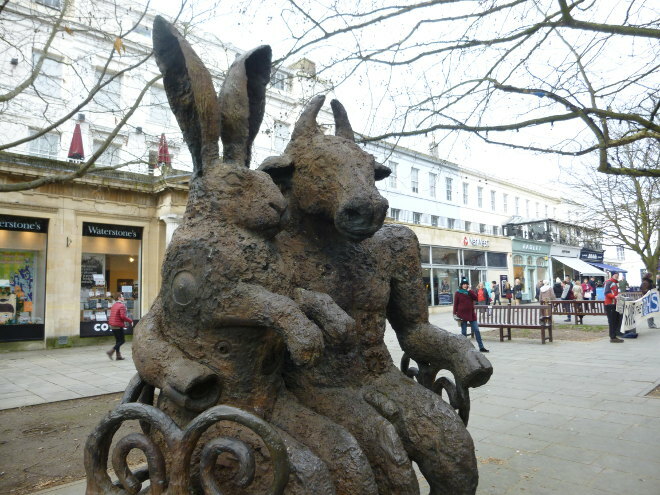 I absolutely love this sculpture that sits on Cheltenham’s grand Promenade. The Hare and The Minotaur is by Sophie Ryder and seems to me to represent the most star-crossed of lovers – a woman with the head and torso of a hare, and a man with the head of a bull. I can’t help but notice how protective the minotaur is over his lepus lover, and how contented they both appear. What prejudices could this adoring couple face in their bid to be together? What qualities might aid them in overcoming any qualms, threats or outright aggression towards their tryst? This entry was posted in Writing prompts and tagged inspiration for writers, Sophie Ryder, story ideas, The Hare and The Minotaur, writing inspiration by Judy. Bookmark the permalink.